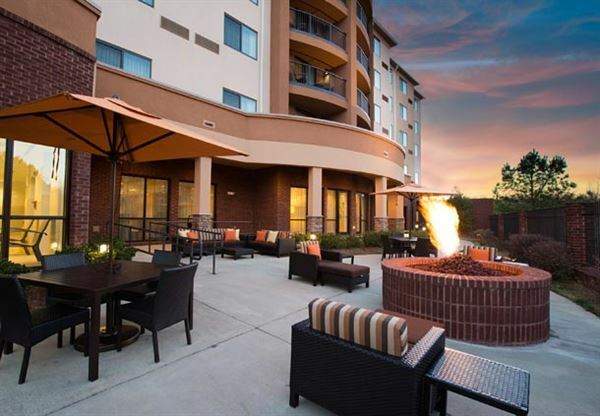 We invite you to stay at the newest hotel in Buford! After a day of shopping at the nearby Mall of Georgia, watching the all new Gwinnett Braves play ball, or recreation at nearby Lake Lanier, come relax at our hotel in Buford, which is a suburb of Atlanta. This Marriott hotel in Buford introduces our new lobby featuring inviting, flexible spaces to work or relax in, free Wi-Fi and easy access to the latest news, weather and airport conditions via our GoBoard(TM). Having a party, reception, or banquet? We have just the venue for you and your guest! The Harvest Hall is a new events venue located right off exit 261 I-75 at Delk Road in Marietta Ga.Tables, chairs, coverings, buffet set ups,caterers kitchen,sound studio, 3 screen video set up for slide shows,servers and sound technicians available,event planners,and much more to make your celebration a harvest of very special memories. Our prices are suitable for any budget, and we offer packages including hotel discounts!